Early voting may ease Election Day lines, but it likely doesn’t bring out more voters. The newly minted Democratic majority in the House chose to devote its first piece of legislation to election reform, signaling just how important that issue has become to the party. While H.R. 1 has little chance of passing as long as the federal government remains divided, Democrats did take control of six more state governments in the 2018 midterm elections, and they are already moving swiftly to expand voting access on the state level. So far, New York has made the biggest changes. Last Thursday, Gov. Andrew Cuomo signed a package of election bills that consolidate New York’s state and federal primaries, allow teenagers to pre-register to vote1 and start the process of enacting same-day voter registration and making it easier to vote absentee. But arguably, the biggest reform was in-person early voting. Starting with this year’s local elections, New Yorkers will be able to cast their ballot over a period of nine days in late October and early November, spanning the two weekends before Election Day. The Empire State now joins 38 other states (plus the District of Columbia) that already allow people to vote prior to Election Day in one form or another. Cuomo and other supporters hailed early voting as a cure for New York’s dismal voter turnout rate: The state ranked 44th in the nation2 in the 2018 general election and 39th in 2016. There’s just one problem: The data suggests that early voting actually doesn’t increase turnout — it just shifts when existing voters cast their ballots. This is apparent at the national level: There is little correlation between the increased popularity of early voting and national turnout rates. 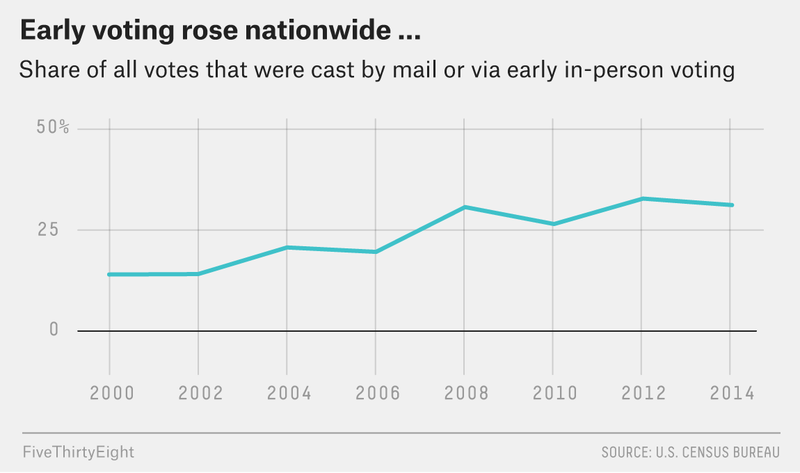 From 2000 to 2014, early and mail-in votes went from accounting for 14.0 percent of all votes to 31.2 percent, according to Census Bureau calculations. Yet during that same period, the U.S. Elections Project found that presidential turnout rates ticked up only a few points, and midterm turnout rates held steady at around 40 percent. We also see no increase in turnout at the state level. Massachusetts is the most recent state to implement early voting, which it did for the 2016 election. Turnout in Massachusetts that year was 67 percent — only one point higher than in 2012. That’s also the same amount that national turnout increased by, so it’s hard to attribute the state’s increase to early voting. Likewise, turnout in Massachusetts in 2016 was 8 points higher than the national average. That’s exactly the same as it was in 2012 and 2014, before early voting was implemented,3 so it looks like early voting has had little effect on turnout there so far. Turnout also hasn’t increased in states where early voting is well established, such as Ohio, which enacted early voting4 in 2005. 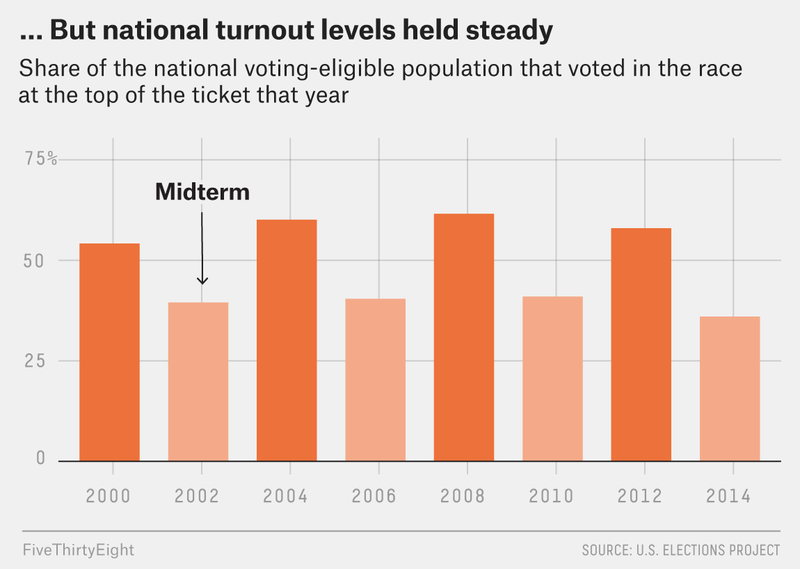 Its turnout rates have held steady relative to the national average in almost every election from 2000 to 20165 — between 2 and 8 points higher than the country as a whole.6 There is certainly no sign of consistently higher turnout post-2005. Political scientists have arrived at the same conclusion. A 2007 paper out of Reed College looked at elections across the country from 1980 to 2004 and found no statistically significant link between early in-person voting and turnout rates. The study concluded that election reforms generally don’t affect turnout as much as campaign field efforts or voter enthusiasm do. Meanwhile, a more recent study by political scientists at the University of Wisconsin, Madison discovered that, when not accompanied by other reforms, early voting actually leads to lower turnout — perhaps because the social and campaign-driven pressure to vote is not as focused as it is when voting must all occur on a single day. Finally, the Government Accountability Office reviewed 20 early-voting studies in 2016 and found that most of them said that early in-person voting has either an insignificant or negative impact on turnout. This doesn’t mean that early voting is a pointless reform; even if turnout remains steady, early voting can make the process more convenient or faster for existing voters. For example, a voter who might otherwise have to take time away from work to vote on Election Day can now cast her ballot on a weekend instead. But as a report from the Brennan Center for Justice points out, the main benefit might actually come from spreading voters out over multiple days, which makes Election Day lines shorter and eases day-of stress on polling places and poll workers. So while early voting can be useful, it should not be seen as a way to coax new voters out of the woodwork. Specifically, 16- and 17-year-olds can now sign up to be automatically registered to vote on their 18th birthday. Counting Washington, D.C. There are many ways to calculate turnout; the definition we’re using is the number of votes cast for the highest office on the ballot divided by the voting-eligible population, as calculated by the United States Elections Project. Data from 2018 is not yet final. Plus the option to vote early by mail without an excuse, which New York does not yet have. Excluding Ohio’s odd-year elections (for ballot measures and the like), when there was no national turnout rate to compare to. The 2002 and 2014 elections are exceptions, but they have good reason to be: No top-of-the-ticket elections were competitive those years. 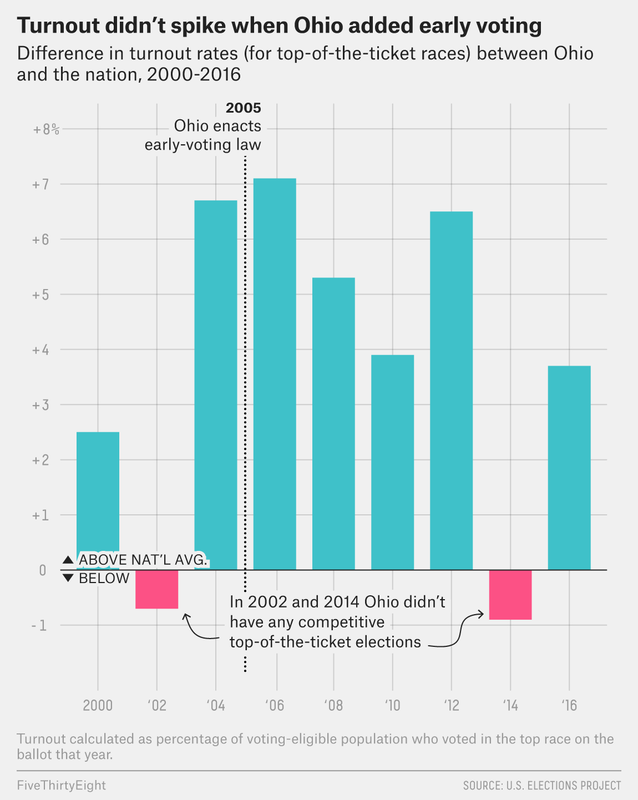 Ohio didn’t have Senate seats up in those years, and the gubernatorial elections were blowouts.